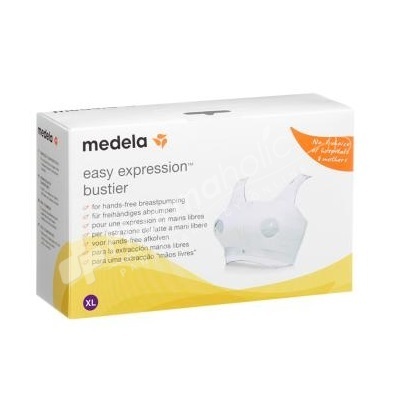 Medela Easy Expression Bustier is compatible with Medela's electric pumps like Swing, Swing maxi, Freestyle and Symphony. The Medela hands-free pumping bra is made of a nylon / spandex blend and seamfree technology. The new Medela Easy Expression bustier is compatible with Medela's electric pumps like Swing, Swing maxi, Freestyle and Symphony. The Medela hands-free pumping bra is made of a nylon / spandex blend and seamfree technology. With the new reinforcement along the top edge and around the pumping openings it holds the shields and bottles securely and even better in place. It gives you freedom to do other things whilst pumping.